Being a locksmith is not my only offering. It is the vocation I am most experienced in, with about 35 years experience across 4 continents. 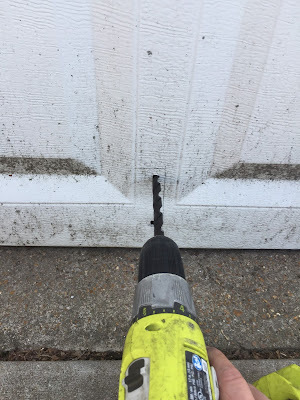 I am lucky to have worked with many different professional locksmith tradespeople all over the world and have learned and continue to learn old and new tips, tricks and methods that will one day benefit customers I come into contact with. Unlike some other locksmith tradespeople and businesses, I choose to believe that locksmiths dont just choose to work on locks and locking products or access control systems. I choose to believe that a locksmith is a person who will work on anything that opens and closes, with particular emphasis on doors. They can be entry doors (swing, sliding, roll top etc), safes (combination, digital, keyed etc), vehicles (cars, trucks, boats, aeroplanes etc), even appliances (cabinets, cupboards, refrigerators etc). 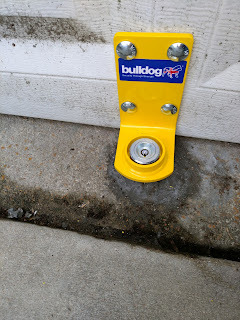 Often I am called upon by various customers to effect repairs to frames and hinges on swinging doors, rollers on sliding doors, safe combination servicing, even repairing vehicle ignition and door access control systems. Just yesterday I performed 3 separate and different types of jobs. One was installing a new replacement Baldwin mortise lock that was warrantied (unknown to the client) by the manufacturer for life. I had serviced the same client a number of times for different projects over the last 4 years, repairing and rekeying locks and doors as their needs arose. The second job yesterday, was repairing a door closer on a shopfront. The client was concerned that they required a new closer to replace their aging model on their shopfront entry door, that had started to slam and not close slowly enough. Their worry was that the glass window might break and they would be unsecure. We simply adjusted the closing speed and latching action on their existing product, saving them hundreds of dollars in replacement parts and comforting them with the knowledge that they continue to be secure..
We were called by a client who had read some of our reviews on Thumbtack, a lead generation service for professional tradespeople that offers alternative leads services to Angies List, Home Advisor, Porch, Amazon Home Services among others. Having been a longtime member of the Home Advisor network (formerly Service Magic) and enjoying 350+ reviews there averaging 4.79/5 stars and also Thumbtack, with about 37 reviews to date averaging 4.9/5 stars, we are pleased that customers in our service region continue to be impressed with our offerings and bless us with many good natured positive reviews . The project we completed yesterday took 5 hours to complete to satisfaction. 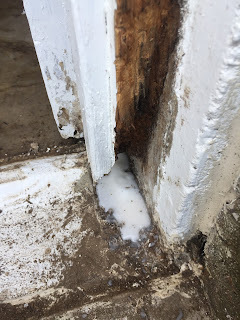 The required repair was on a 75 year old home, where the basement walkout door was a custom built door installed when the house was built, but was suffering from the very common issue of water damage. 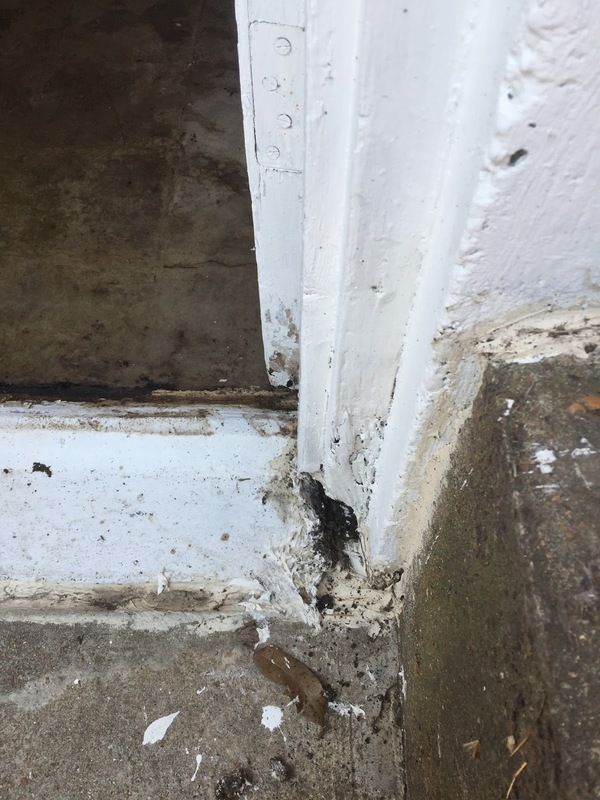 The home owners were selling their property and moving out of state and a condition of the sale was to improve/repair the back basement walkout door. They had already contacted a number of contractors who had all determined that replacing the custom door would have been the best suggestion. The average estimated cost for supplying and installing a new custom door and frame in that location was ~$3500.00. Plast-Aid is a product we have been using for about 7 years now. We found out about this brilliant product while researching PVC repair products and were delighted to learn about the other uses for the product. The Plast-Aid video below explains the uses of this product and how easy it is to use. In the above video, they hint at other projects where Plast-Aid can be used successfully. 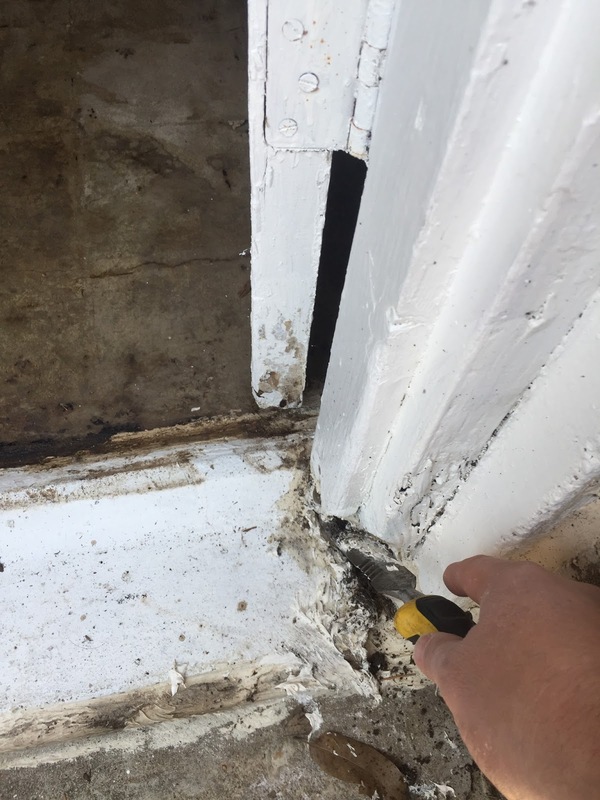 We decided that the benefits of water-proofing would benefit our customer because the repair would mean they would not have to replace their door and frame. 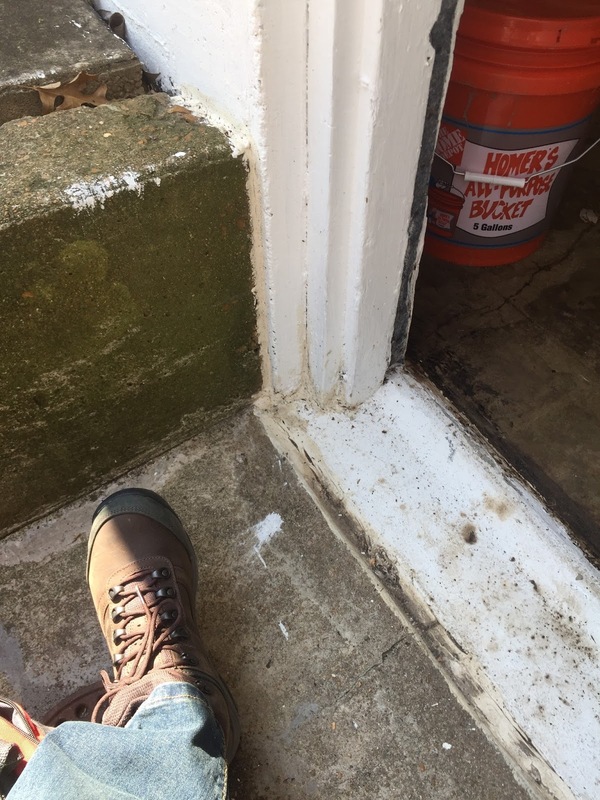 In the first image above (my foot), you can see that the client had already attempted to effect repairs using standard caulk and just filling in where the water rotted gaps were appearing. 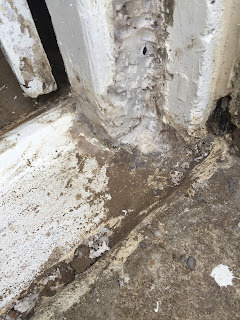 The caulk did not dry correctly and the result was not suitable enough for painting, while not actually repairing the water damage within and preventing additional water damage. The next image shows the hole where i dug out the old caulk. The amount of caulk used was far too much and didnt do anything to cure the water damage. It simply was an attempt to cover up and hide the damaged area. This next image shows me digging out the vast amounts of caulk and dirt that had creeped into the water damaged hole beneath the old door frame. 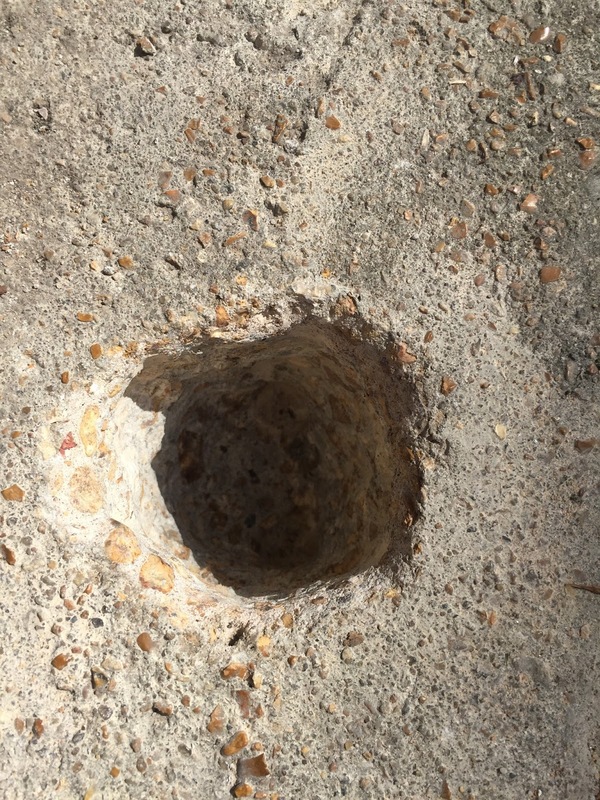 We must have pulled out almost a quarter cubic yard caulk, mud and other garbage from this hole. The next image shows how much material we had to cut out, of the water damaged wood, before we could begin the actual repairs. 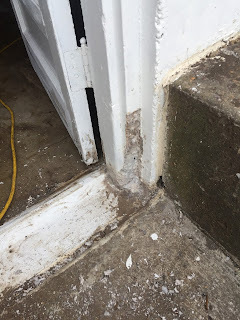 You can see the Plast-Aid that we used to fill the base of the hole, left by the water damaged frame. We actually used 3 separate containers of the Plast-Aid product to make enough material to fill in the base. This is designed to create a water-proof base with which to build upon. The next image shows the entire filled portion where Plast-Aid was used to provide the filler. Plast-Aid is great because it dries and "cures" quickly to enable you to build upon each layer of repair reasonably quickly. The product takes about 10-15 minutes to cure to a state where it can be molded into a soft putty and then be inserted into the application, without it dripping everywhere and making a huge mess. The last 2 images show the completed Plast-Aid repair, where we used the Plast-Aid to provide a water-proof barrier for the future. We cleaned up the looks using our Makita 3/8" belt sander that we use as a power file. 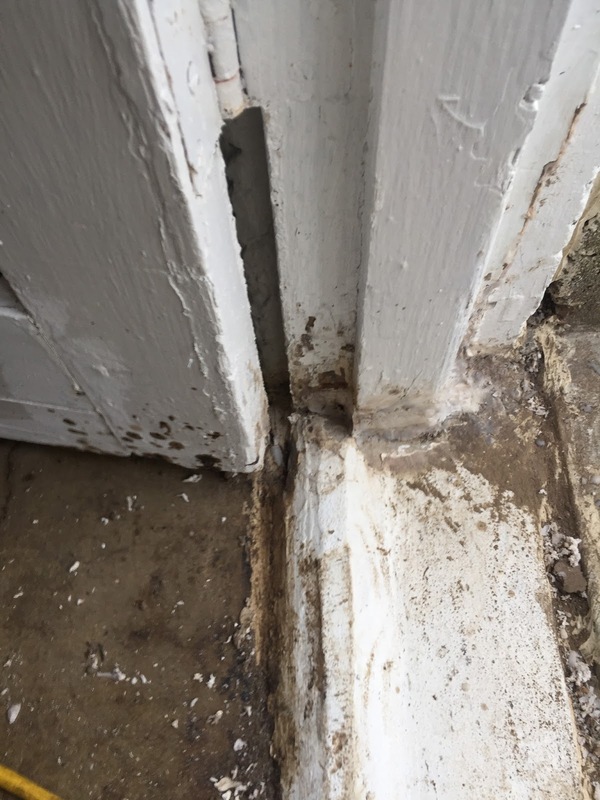 This fixed the water damaged frame to the point where the customer can now use wood filler to patch over the top, sand and paint. We are not painters and would never claim to be. We advise our clients prior to any repairs that we suggest they may want to contact a professional painter to put the finishing touches on important ambience of a project. Purchasing Plast-Aid through their website is the better idea than through online market places, in my opinion. See the source below for a link to the Plast-Aid home page, which also shows many other applications for this fabulous product. 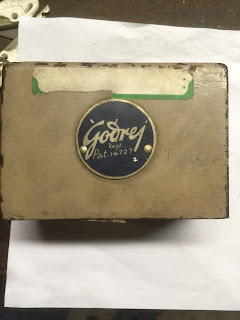 Godrej were a 19th century Indian manufacturer of money boxes, safes and cash boxes who closed down in the early 20th century. A few months ago, a customer contacted us to get their money box opened and have a key made. 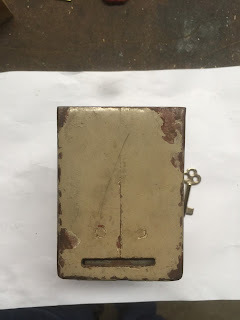 We made sure to take some pics of this very old box and how we made the key. After combing through multiple key blank provider sources and trying to find even something close, our misfortune to find an appropriate key blank made us decide to modify another key blank that was suited to another product. This particular box, we sourced back to about 1908. It appears to be in surprisingly great condition for it's age. You can see the key blank we decided to use to modify. of the key operated lock. 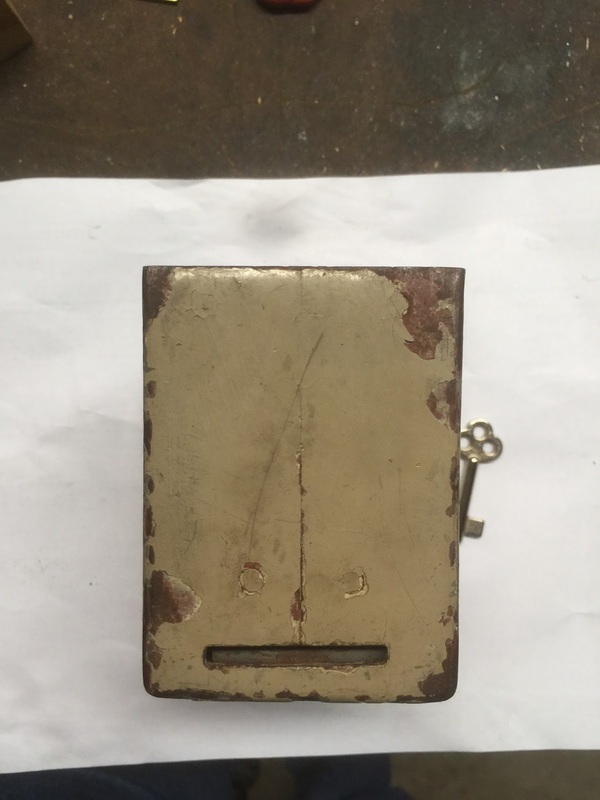 The slot has a welded on flap inside that is designed to prevent removing coins or notes from the locked box. 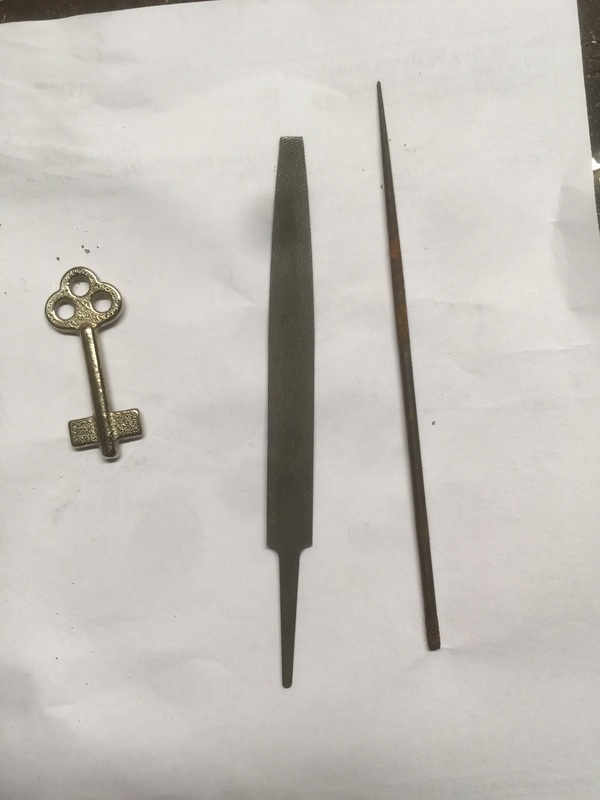 Some of the tools, we locksmith craftsmen choose to use when impressioning keys to locks include a selection of files. In this case we used a 4" warding file as our primary file of choice for this project. 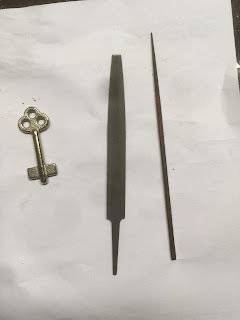 The impression system of key fitting is a long time treasured skill, unique to the craft/trade of locksmithery. There are many books written over the years that teach the skill to new players, but practise makes perfect. After all, "Repetition Is The Mother Of Learning", according to popular theory. 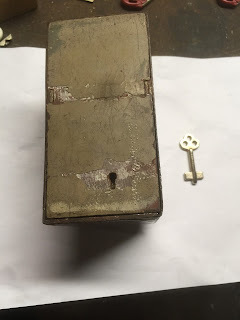 One of our most popular posts in this blog is "How To Open And Make Keys To Antique Furniture Locks" and explains the method to impression keys to old fashioned 'skeleton key' type locks without damage. You can see in this pic, we were required to drastically modify our selected blank and hand file the key. 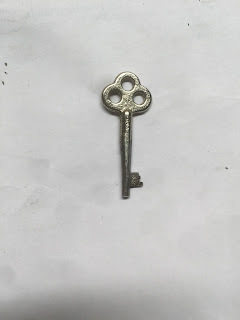 We were required to reduce the guage of the key to enable it to enter the keyway, because we could not find a suitable blank. 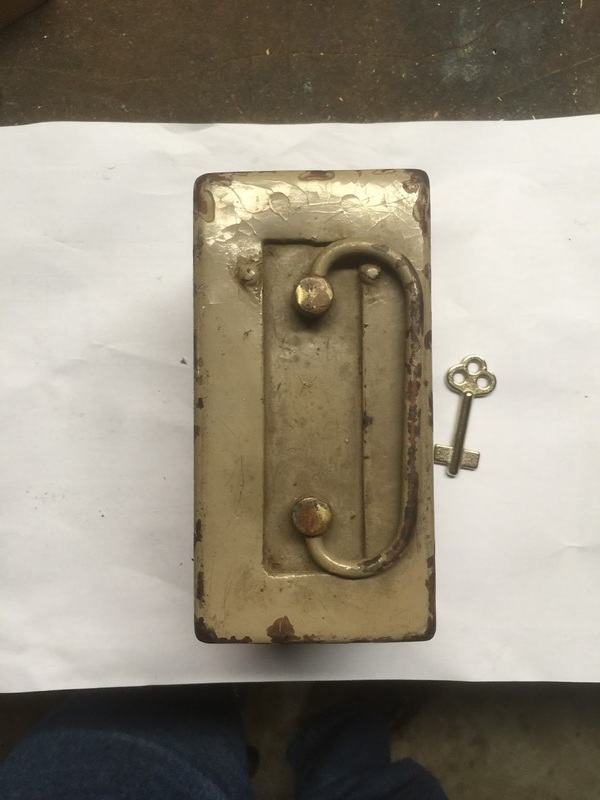 The finished key works beautifully in the lock, maintains it's originality (and antique value) and can only be withdrawn from the lock when the door is closed and locked. Not a difficult project for an experienced locksmith, but rewarding nonetheless. There are many talented locksmiths around this country and the world who still practise the art of impressioning today. 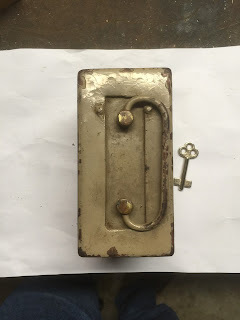 The skill is unique to the locksmith trade and one that can save customers money and heartache when needing service to their antique lock, safe or furniture product. Earlier this week we completed an unusual request for a customer. 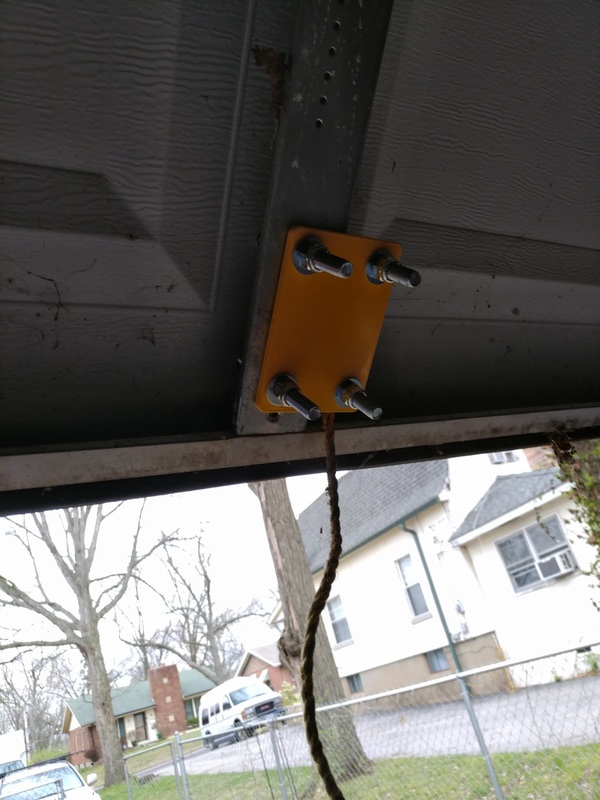 The customer needed to secure his garage door with much better security than the flimsy standard garage door lock and assembly to protect substantial value in tools and inventory. 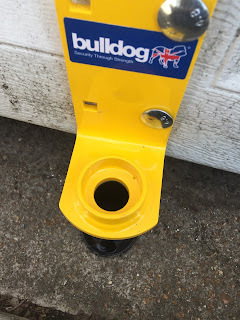 There are many options available to suggest for this type of application and I remember that the Bulldog GD400 is definitely one of the better products out there. The unique strength of The Bulldog GD400 is it's best quality. Made from treated 3/8" (10mm) thick steel plate and using another 3/8" (10mm) thick steel plate for internal anchoring and held to the door with stainless steel hardened carriage bolts and pressure nuts, the product not only looks great but is very, very strong. The strike plate is a 4" (100mm) long hardened steel tube that is anchored into cement. The first step is to mark the holes in the door and drill pilot holes through the outer skin and into the aluminum rail that makes the internal frame of the door. Drill a couple of holes to hold the plate to the door. We only drilled two of the four holes just to line up and level the product and prepare for the next installation steps. Once we attached the plate to the door, at the right height, we rested the plate on the strike tube and penciled around the bottom plate. 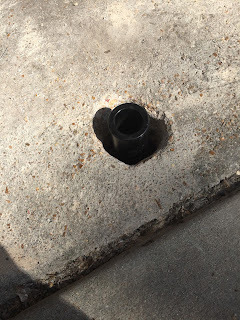 Now that we have marked the spot for the strike tube location it is time for the hard part. 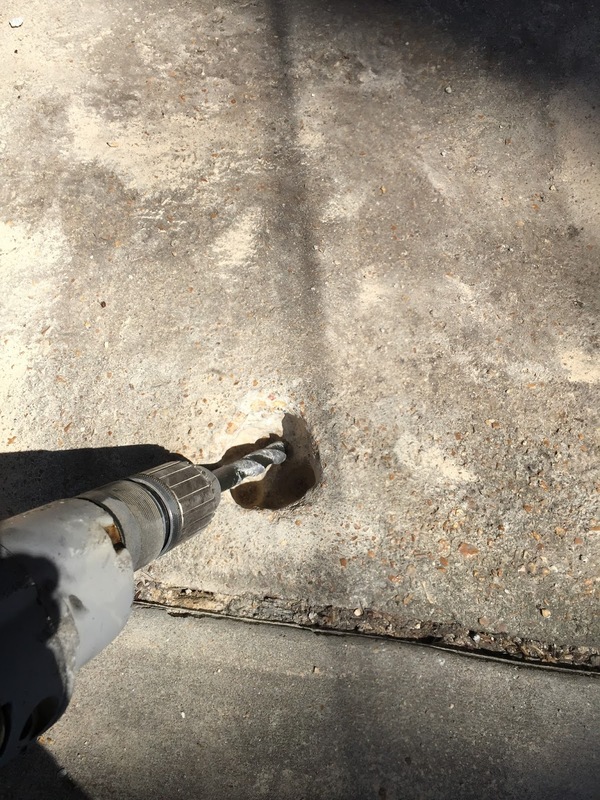 Drilling a 5" (125mm) deep hole in the cement garage floor base. This is quite an older home in an older part of our region and the original builders laid a 6" (150mm) thick concrete floor with heavy gravel embedded within their mix. Drilling the hole took 2 hours alone using a heavy masonry drill bit and hammer drill as shown below and we used a cold chisel to help with the finer hole adjustments. 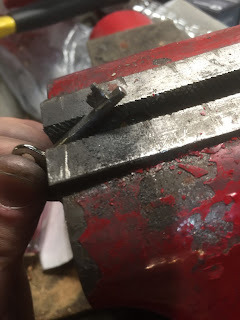 Working slowly and constantly measuring and remeasuring to maintain accuracy, and you eventually end up with the correct sized hole, to the necessary depth. You can see the mixture of gravel in the cement in this next image. We poured a little sand and stone mix into the hole to get the strike tube to sit at the appropriate height and then filled our hole with new cement mortar, anchoring the strike into the concrete. 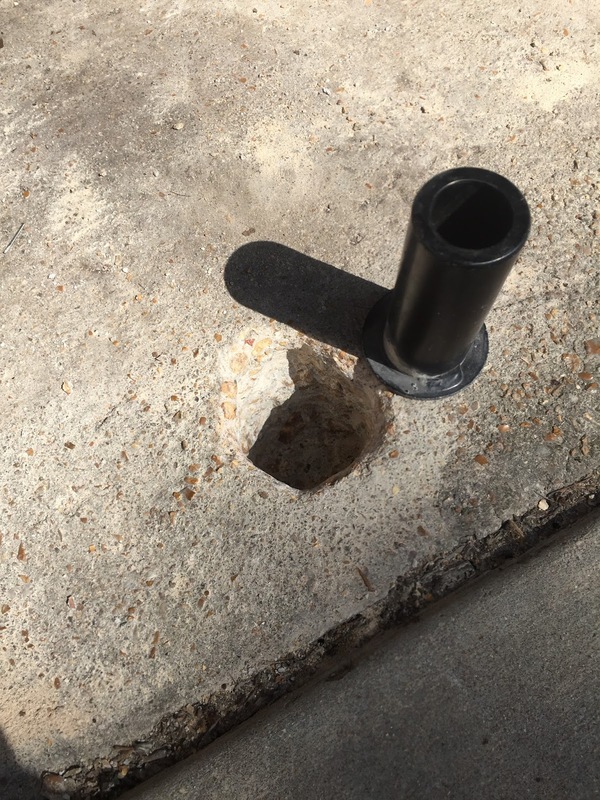 We deliberately made the cement into a little hill, so that when it dried it would lessen the chance of a tripping hazard. The end result of the fitting looks good. All that's left is the mandatory 48 hour drying time. It is a good idea to keep the application wet while it is drying, to assist with curing. 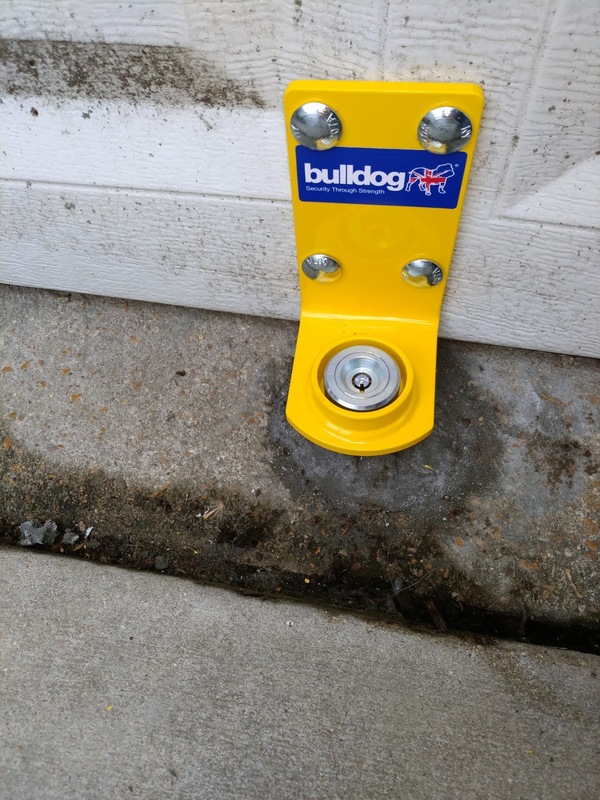 2 days later we returned to square up the fitting, drill the extra holes and secure the inside mounting bracket. The end result is a nice and square (plum) fitting that is super strong. The completed installation shows the stainless steel hardened 7 pin tubular (Ace) cylinder locking body, that secures using stainless steel ball bearings inside the strike tube. In the first image at the top of the article, you can see a rubber cap that fits over the cylinder. 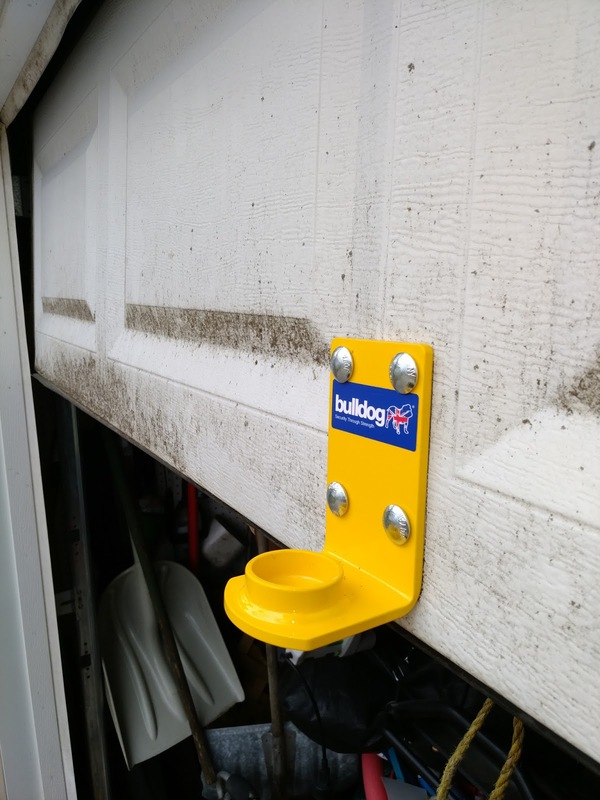 This protects from rain, dirt and grease entering the cylinder and it is recommended to use it for increased product longevity. Visit the manufacturers website in the source below to purchase. 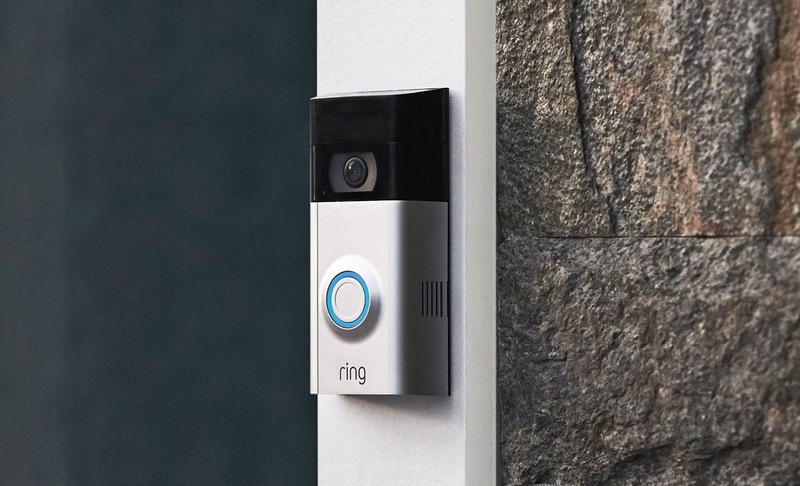 We have written a few articles in recent months about the recent Amazon takeover of Ring and their intention to meld it into their Amazon Key Network of Smart Home products. 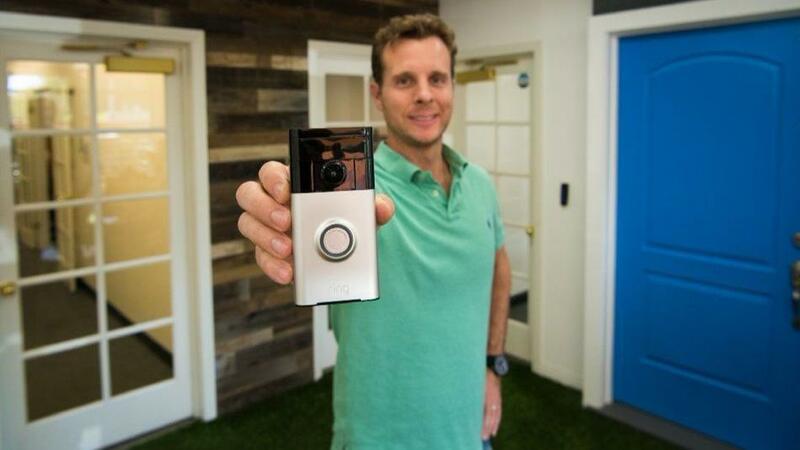 The Ring product has seen stellar sales in recent years, after failing to score a deal on the very popular television show, Shark Tank. I find it especially interesting that this recent acquisition by Amazon arrives on the heels of a patent infringement lawsuit by Skybell, who maintain that they are the original patent holders of the technology (see our article). According to an article on Cnet (see article), the Amazon acquisition of Ring was finalized in February. 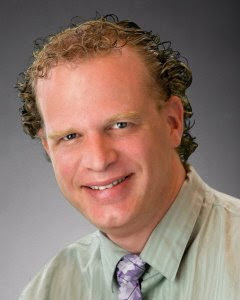 The article reports that Limp ( a Seattle based company) and Siminoff (from Ring's California head office), took the opportunity to discuss some more details about the acquisition after the deal closed. 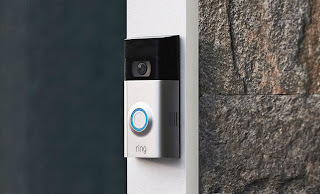 The article alleges (unconfirmed) that Amazon paid about $1 Billion to acquire Ring. Another article appearing in The Guardian (UK), also confirms the deal details and also indicates (like Cnet) that Amazon will continue to let Ring trade in it's own right (like Bezos does with the Washington Post), but that as a result of the Amazon takeover, Ring drops its price for it's award winning product to US$100 from US$150 and £89 from £159. It is no secret that we are not impressed with this offering. 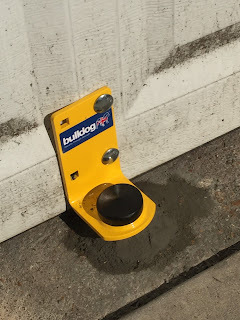 With the amount of customer data issues, across the news today and Amazon being one of the largest acquirer of customer buying/purchasing data, combined with the attempts to infiltrate the residential and commercial physical and electronic security markets with sub-par quality products, we feel that allowing companies like these to enjoy unfettered access to your private dwellings, even outside of regular business hours is opening you and your family up to increased security issues. I would expect insurance companies to jump on these changes and no doubt increase insurance premiums because you allow more access to your properties than normal. 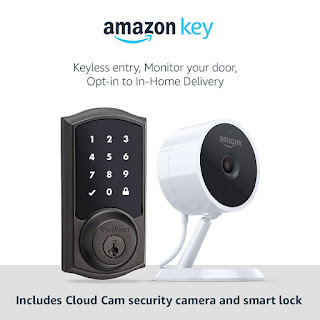 As a concerned security products installer and locksmith services provider, I feel it is my responsibility to inform you of the shortcomings and security issues surrounding the use of services like Amazon Key might bring. Far be it from me to tell you what to do and whom you choose to give access to your doors, but I will continue to refuse to open myself and my family up to the possibility of unauthorized and uncontrollable entry to our home and properties. Pictured above is a Google Maps cropped image of the Maryland Heights and Creve Coeur, Missouri area. According to a recent article in the St Louis Post Dispatch, a man was arrested in connection with 8+ alleged break ins in the Creve Coeur and Maryland Heights areas, where the opportunist broke into residents homes while the residents were at home. Apparently this opportunist simply walked in through unlocked doors. Crimes of opportunity occur when confident yet brazen opportunists will take advantage of unsuspecting residents who may be home asleep at the times of their crimes. As a professional locksmith and security products installer, I have been installing and repairing doors and security products across 4 continents for about 35 years now and have seen many and varied aftermaths of crimes involving break in. Many homeowners and residents incorrectly assume they are still protected even when they are home, often by their alarm systems. Unfortunately, in many cases the alarm systems are not turned on if you're home. Vigilant and concerned residents will lock their doors at night and sometimes set alarms to protect their families and their properties. There are many and varying products available today to enhance and increase the security of our homes and businesses. 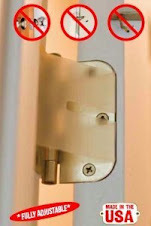 Many people already have deadbolt locks installed on their doors, but these are useless if the locks are left unlocked. Thankfully, many modern day electronic and battery operated deadbolt locks include a self locking feature which is usually a motor driven bolt mechanism that automatically throws the deadbolt 10-15 seconds after the door is closed. And while this can be a great feature to have, many residents find that their doors are often not aligned correctly to allow the deadbolt to throw fully or suitably. Other security features can include handle sets that are set to be locked externally all the time (an option that can be manually switched on and off as desired, depending on the brand of lock set). Yale were the original creator of the famed modern day nightlatch. Other brand like the Lockwood 001 deadlatch (Australia) became synonymous with almost all front doors in Australia and New Zealand. 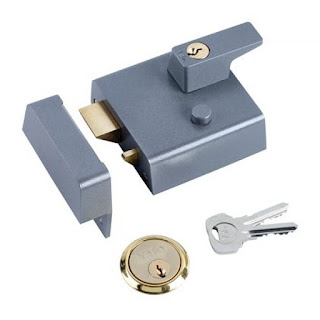 Today, double cylinder (keyhole both sides of door) locks are frowned upon by AHJ's (authorities having jurisdiction), building inspectors, code compliance officers, fire marshals and insurance companies because of the chance to be physically locked inside and unable to escape easily should an emergency occur. Whereas some police officers and supposed security appraisers will suggest that double cylinder (keyed inside and out) locks increase your security, the reality is that life safety trumps security in all cases. 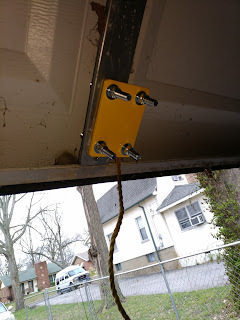 The improvement in the deadlatches that made them much stronger and better security was because of the deadlatch activator that effectively prevented the main latch from being able to be slipped back easily (you can see the little activator in the picture above - just below the main latch). 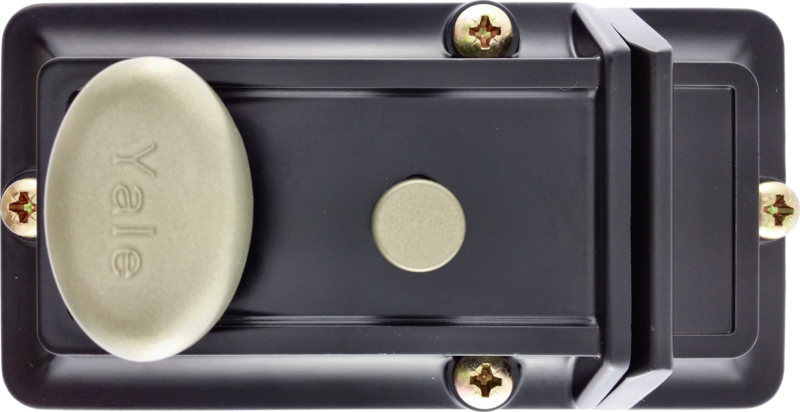 Combined with often concealed mounting screws and extra long strike plate screws, security can be dramatically enhanced using a rim deadlatch. Many of these newer style of deadlatches are also available in a non-internal keyed version and most locksmiths can explain this to you if you ask. 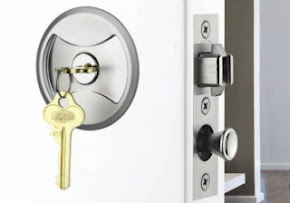 We have been providing premium quality lock and security products and services in our hometown region for about 12 years now (we reside in Creve Coeur) and are called often by residents in the area and the wider areas and surrounding towns to repair and enhance the security of their homes and businesses. We are happy to provide no obligation, free home security inspections and estimates to help you improve your home or business security. We will determine likely areas where your home or business might be vulnerable and suggest cost effective solutions to better protect you. 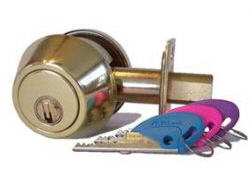 Most locksmiths around the country and across the world will also provide similar services. I strongly suggest that you make contact with a local locksmith in your town and have them provide you with a security appraisal and estimate that could better protect your property, your family and your friends. Above all - REMEMBER to Lock Your Door at night! We have previously written articles about the Amazon Key service and various products included therein. Many homeowners are choosing to allow Amazon access to their private dwellings, to enable more secure delivery of products ordered through the Amazon marketplace. We previously discussed the failings of this endeavor, including our opinions that having and using this service, reduces any security of your home or office. While using the camera, can be advantageous in identifying the delivery person and whomever entering your premises, do you really want almost anyone enjoying unfettered access to your private abode? Also, subscribing to this service involves monthly access fees for connecting cameras and door locks to the Amazon Cloud. You can opt to not pay a monthly access fee, but images are stored only for 24 hours. According to the website (in the source below), Amazon Key products need to be a single cylinder deadbolt (electronic) and separate from the operating handle hardware. Amazon suggest on their website that to be able to use and operate the Amazon Key system, a would be user must use the product on a door that is 1-3/8" - 2" thick, be only a deadbolt (electronic) and separate from the handle hardware. You cannot use the service with French (double) doors, Rim (surface mounted) locks or mortise locksets. The lock compatibility diagram above is a little misleading because it shows the deadbolt with a lockable lever handle lock. That scenario means that you must leave your handle lock unlocked, when allowing the Amazon Key service to operate. Will you remember to leave the handle unlocked? The most suitable option here, would be to change your operating handle from a lockable version to a passage version, to ensure the handle remains unlocked and not lockable. Amazon are suggesting that the Amazon Key program be operated using one of the following types of locks. Each of the models above must be the Amazon Key edition of those locks. To convert your existing deadbolt lock to a compatible Amazon Key serviceable lock, you would first require to already be using a Kwikset brand deadbolt on your door. And use the Kwikset Convert kit installed in place of your existing turn button. The Kwikset Convert kit is Amazon's version of the popular August Lock and similar to the Lockitron product. Apparently, the Amazon Key service is also designed to operate with the Alexa Smart Home Speaker, which allows you to voice control your connected devices. The Kwikset SmartKey system is well know across the market for it's shortcomings and problems. 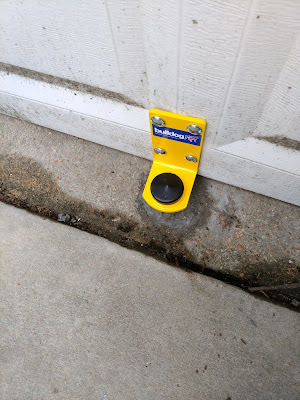 Our most popular post Kwikset Smartkey Problems has gone viral, chalking up over 100,000 views to date and is lately averaging 97 views a day. 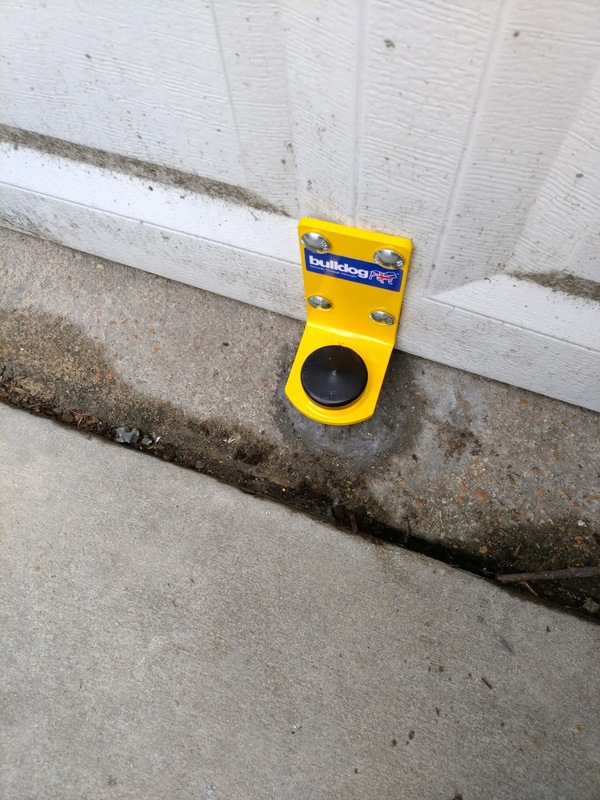 Not mentioned in almost every article we read online, is the troubleshooting issues including but not limited to weathering, battery failure, house movement/building construction issues and improper door alignment issues that affect continued operation of electronic operated deadbolt locks. 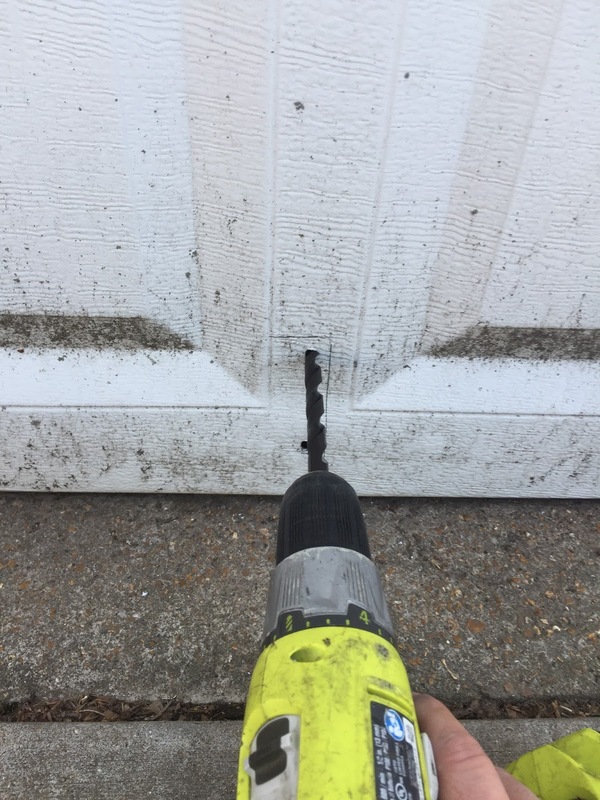 As door repairers and locksmith technicians, we specialize in repairing and adjusting a great many doors around our geographic region. Most common, is the occurrence of door alignment, where the door will move and the lock does not line up with the strike plate. While repairing this issue is often straightforward, the inconvenience to the consumer, by being unable to lock their doors becomes a recurring nightmare. Many of our customers, who purchase battery powered door locks will often replace the batteries about two or three times before deciding that the added cost and inconvenience becomes too much of a chore, especially when they can not be confident and assured that their door is actually secure. They will most often revert to mechanically locking the deadbolt with their mechanical key, ensuring they "know" their door is secure. It seems like a great idea to enjoy the experience of keyless and wireless operating door locks, except for the long term implications of poorly fitted doors and insufficient manufacturing quality of hardware aimed at securing our homes, families and lives.